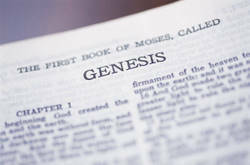 The Bible can be used as a primary part of your Christian homeschooling curriculum. It can serve as the basis for spiritual and academic instruction for preschoolers through high school for most subjects. In teaching the alphabet or children that are just beginning to read, I have used the Bible to teach and practice certain letters of the alphabet. I work on one letter at a time and teach Bible names or places that begin with that letter. For the letter Aa we could read stories about Adam or Abraham, practice writing the letter Aa, and identify pictures of things that begin with that letter. There is so much material within the Bible that you are able to use it for multiple grades from preschool on up. I use the Bible as a source of inspiration for writing lessons within our Christian homeschooling curriculum. For instance I will give a list of related words and have our children retell the events in their own words. I might give words such as Daniel, lions, cave, king, pray, etc. and have them write a story about Daniel in the Lions' Den. Another lesson is to use passages of Scripture for handwriting practice or copy work. Just think about how good it can be to have your child memorize and practice writing chunks of Scripture. You can purchase a packaged, Christian home school curriculum if you desire, such as Abeka or Bob Jones but there is plenty of material within the pages of the Bible.